2012 SEASON PASSES ON SALE! 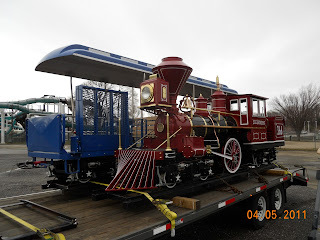 Since the replacement of Waldameer's L. Ruth Express train engine last season, plans have been in the works to purchase a whole new train engine and coaches for the 2012 season. That means less time waiting in line and more time riding the Waldameer classic. Chance Rides has been working hard to get the L. Ruth Express II ready for delivery before the end of the year. 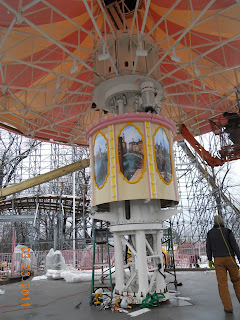 But you will never guess where we spotted Waldameer's second C.P. Huntington train engine! At the annual IAAPA Expo in Orlando, Florida! This yearly convention brings all sorts of vendors, manufacturers and amusement venues to one spot to learn, sell and buy all sorts of new and exciting items for the attractions industry. 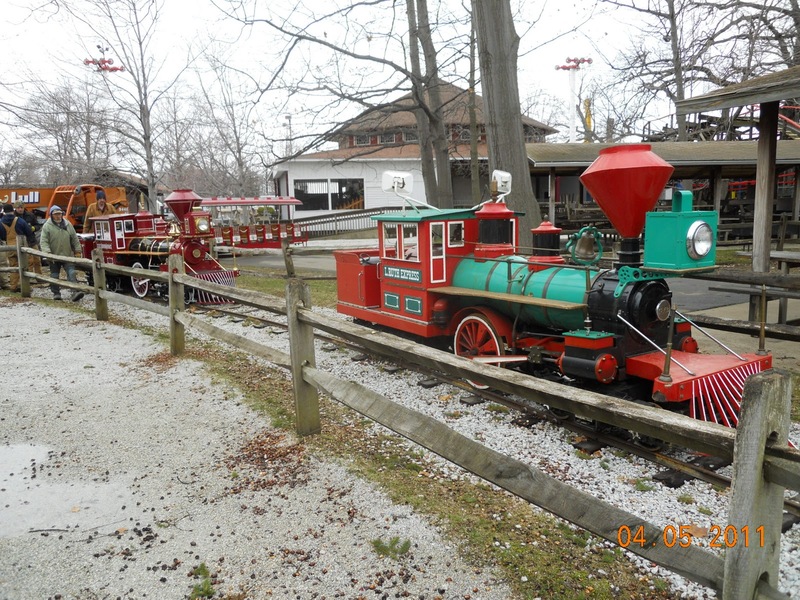 This year, Chance Rides featured Waldameer's very own L. Ruth Express engine at the show. 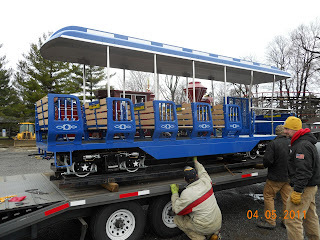 This bright blue beauty was all ready to chug along Waldameer's tracks. But the new engine won't make it to Erie, PA until the rest of the coaches are ready to ship as well. So now, we wait patiently until the new train is ready. 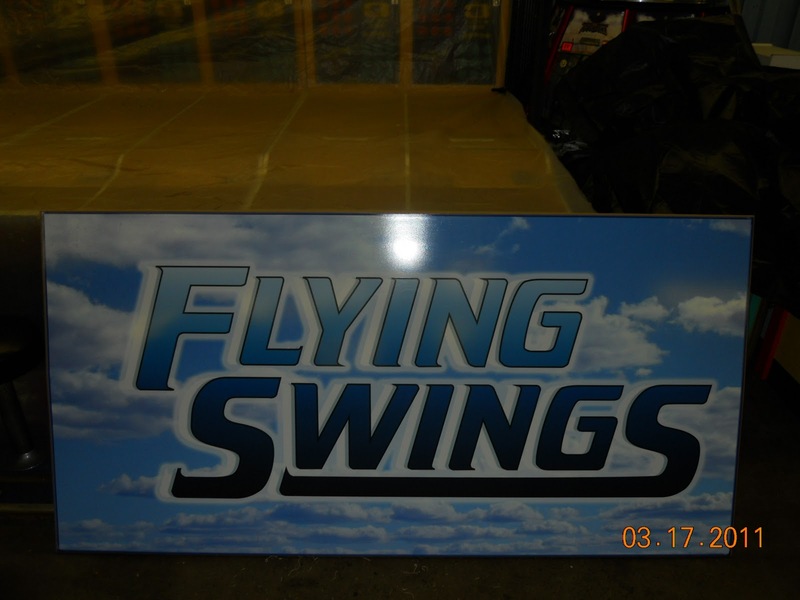 Keep and eye out, you may just see it driving down the highway on it way to Waldameer soon! It's been a long time since a Waldameer update. So many things have happened in the few short months following Labor Day Weekend. 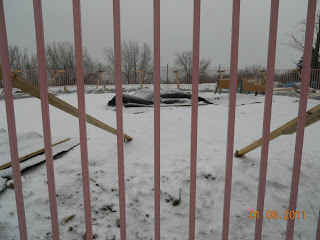 Most of the park has been prepared for another Erie winter by covering up and tearing down signs, rides, tables and benches. 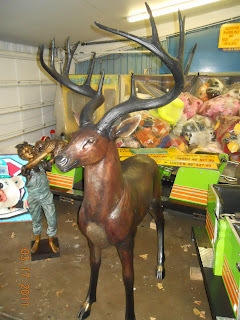 But don't think Waldameer packs up and quits for the winter! Plenty of things are happening at the park to make it an even better place to visit in the summer! The most drastic change that is happening for 2012 is the park is going cashless! That's right, cashless. But what does that really mean? How will our Guests pay for things? Since 2010, Waldameer has been using its new bar-code system to operate the park. 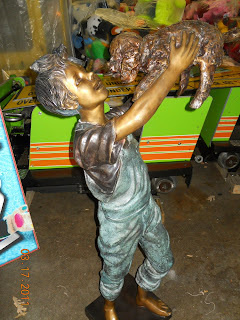 With this system, Waldameer was able to introduce its own type of money called Wally Points. These points can be put on a Wally Card and spent anywhere in the park. You can recharge your Wally Card, put any amount on it and use it for the rest of your life! Wally Cards have worked so well that for the 2012 season, Waldameer will only accept Wally Cards, Credit/Debit cards and Gift Cards to purchase items inside the park. 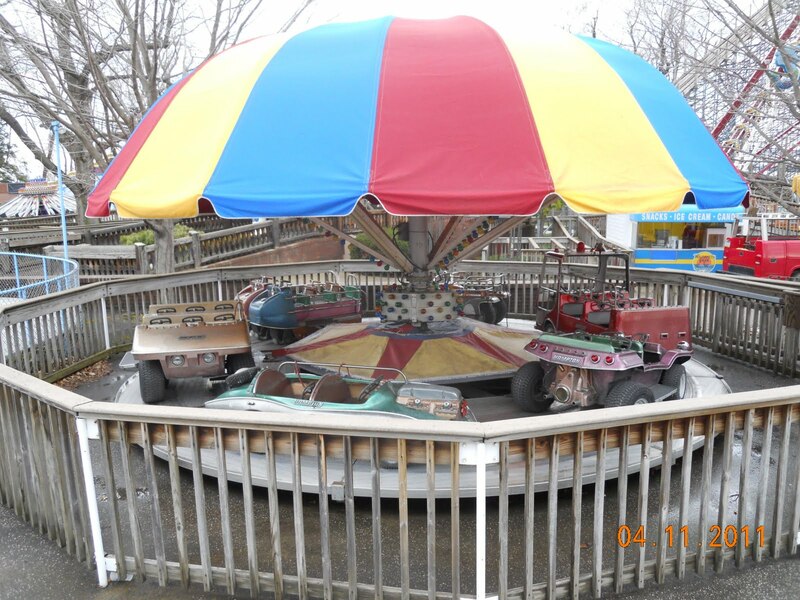 The only place cash will still be accepted will be the Merry-Go-Round Ticket Booths, the Arcade and Wally Card Kiosks. To make it easier to get a Wally Card, eight new self-serve Wally Card Kiosks are being installed throughout the park. These big, yellow stands allow Guests to purchase, reload and check balances on any Wally Card. With eight new kiosks, it will be eight times easier to get your very own Wally Card! Stay tuned for more exciting winter news! Even though this past Thursday was muggy and wet, the attendees at the annual Erie Club picnic held at Waldameer were still able to enjoy themselves. One person in particular made a surprise appearance to the Erie Club picnic. Governor Tom Corbett was able to take time out of his schedule and stop by Waldameer to meet and greet and eat with the attendees. Of course we had to get a picture of the Governor during his visit to Waldameer. 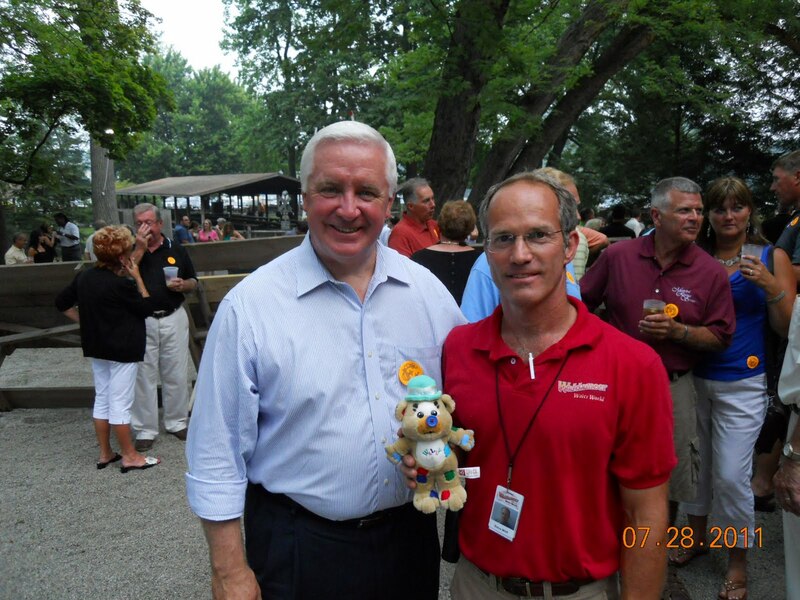 Luckily, Governor Corbett let Steve Gorman grab a quick photo with Wally Bear too! Thanks to the Erie Club and Governor Corbett for coming out to the park and having a great time! Here, Here! The Grand Marshalls are Here! A car fit for the Grand Marshalls! Everyone knows that Waldmeer loves to celebrate summer holidays with great family fun and spectacular fireworks displays. But this year, Waldameer was honored by the Millrcreek Township to celebrate the Fourth of July a different way. The Waldameer family was asked to be the Grand Marshalls of the July Fourth Parade! Wally and Wendy were so excited! Wally and Wendy had a great time singing and tossing candy to everyone! The parade was a blast with Wally and Wendy riding in the back of a truck as well as the Waldameer Showtime Theater Cast all tossing candy and waving to the throngs of smiling faces on either side of 12th Street. The celebration went on for over an hour the morning of the Fourth and afterwards, all of the Waldameer staff had to get back to the park in order to open for the holiday! Wally, Wendy and Waldameer would like to thank Millcreek Township in letting us celebrate the United States Birthday with them! Thanks to our 2011 Season Pass Holders! Thanks for everyone who purchased a 2011 Season Pass this year! We hope you enjoy the summer fun at Waldameer! But even if you didn't get a chance to purchase a Season Pass this year, there are still great deals for you and your family to save on Waldameer's Combo Passes! 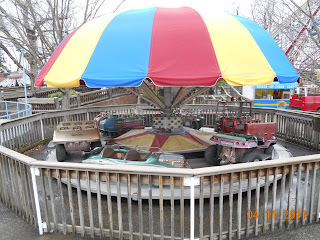 Just visit waldameer.com to learn how you can save $3.00 by purchasing via our online store and also by bringing in Pepsi cans to our ticket booths! What great weather Erie has had for the past few days. The sun has been shining, the temperature has been warm and the rain only comes at night! Perfect weather for a trip to Waldameer. Unfortunately, a swift storm Sunday night put a damper on the fun late in the evening. It rained and rained and by the time it was over, it was too wet to celebrate with our free fireworks display by Zambelli. 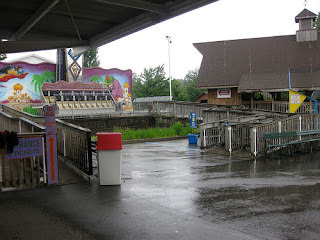 Waldameer looks sad in the rain! But that doesn't mean the holiday weekend was a bust! With the sun shining again today and no threat of rain, Waldameer plans to celebrate Memorial Day by shooting off their fireworks from the night before! So put on your swim trunks, grab your friends and family and get ready to celebrate Memorial Day where family fun is number one! 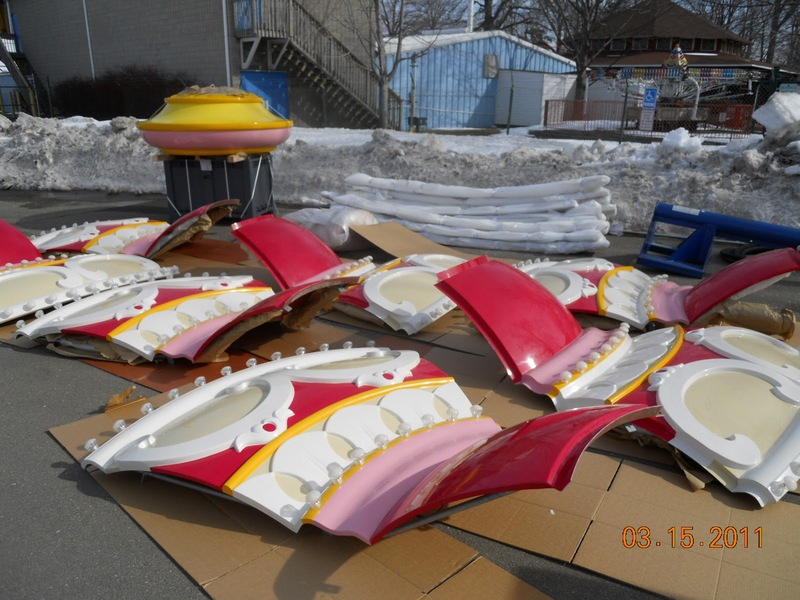 With Waldameer's opening weekends running smoothly, one of the park's most treasured rides had a few "glowing" touch ups to show off this weekend. The 41 year old Whacky Shack was painted with Wildfire paints to make some of its scenes pop under the black lights. 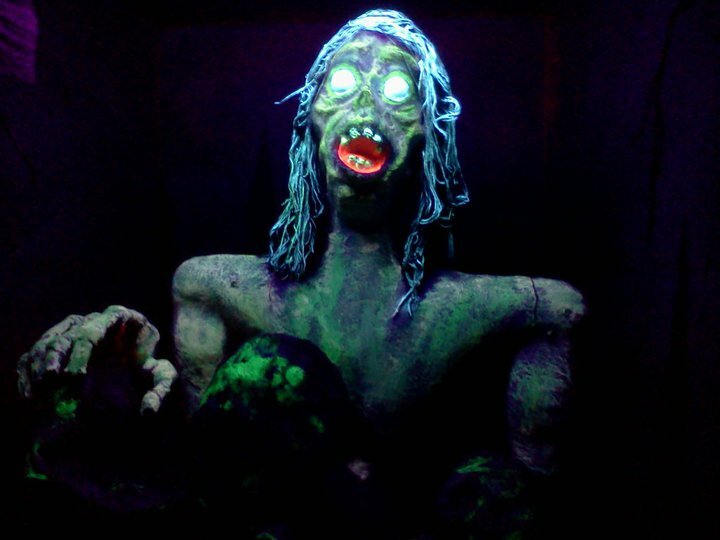 Randy Skalos, a DAFE member and dark ride enthusiast, used his artistic talents and gave one of the Shack's zombies a face lift! The ghoul now looks even more scary! There are plenty more improvements in the Whacky Shack that are definitely worth seeing. But you'll just have to take a ride to see them! Our WQLN "Ride it First" Event is underway and even the sun decided to show yesterday! Eager guests and riders came out to support our local public radio and TV station by paying a few dollars to be the first to ride the three new rides in the North End. All the proceeds are being donated to WQLN in support of their broadcasting. With the sun shining, the North End showcases its wonderful colors. Today, even with the chance of rain, riders are braving the weather and riding Waldameer's new rides. WQLN's even runs the rest of the day today until 6:00pm. 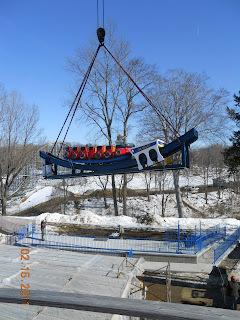 The next chance the public will get the opportunity to ride will be on Waldameer's opening day of the season starting May 7th. It's a bird! It's a plane! It's... the Flying Swings! 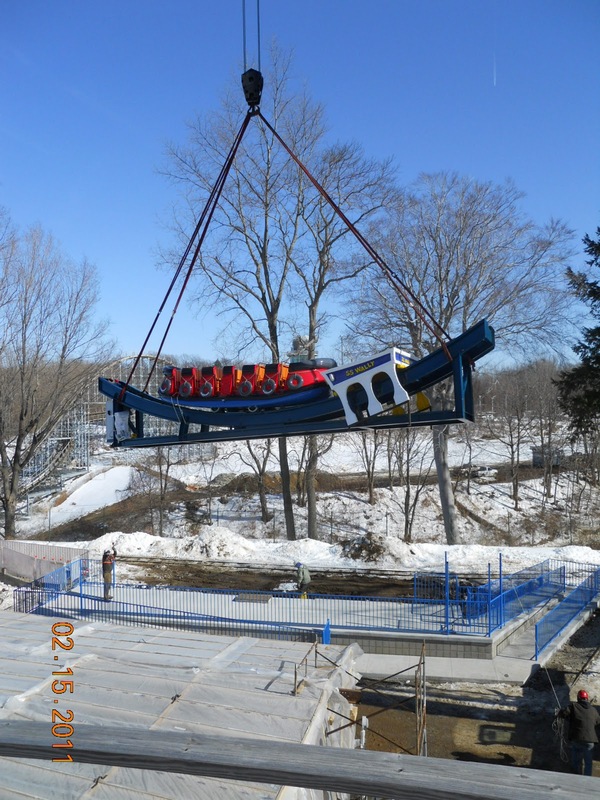 With fingers crossed, the Flying Swings took its first flight over the bank at the North End. 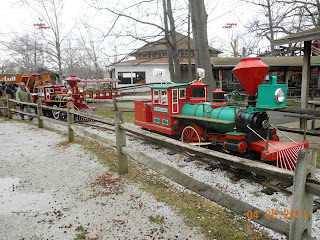 The smooth ride soared the seats over the L. Ruth Express tracks, by the Ravine Flyer II and out toward Lake Erie. Check out the video to see how fun this new ride will be! In a blur of beatiful colors, the Flying Swings is mezmorizing to watch in action. 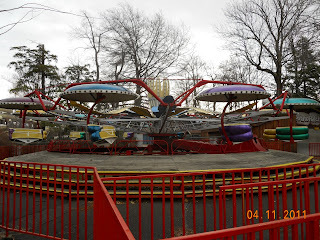 You can only imagine how exhilerating a ride would be flying over 30 feet in the air and dangling your feet over all the excitement of the North End. You can't miss a ride on the Flying Swings this summer. It'll be great for the whole family! As promised, Wally Bear's new ride set sail for it's maiden voyage today making it the second ride to operate at the North End. The Rock'n Tug spun and swirled back and forth with ease, enticing everyone to hop aboard! 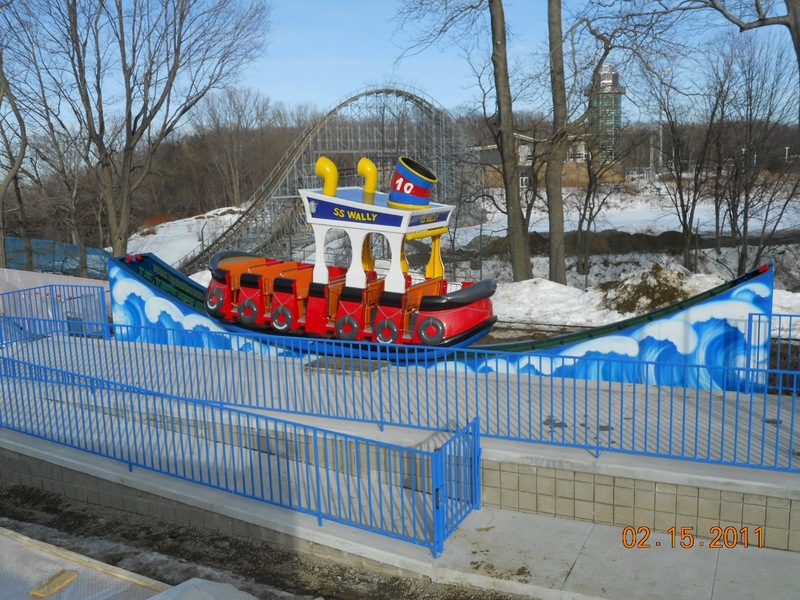 It won't be too long before the first riders will be seen laughing on the SS Wally for Waldameer's WQLN "Ride is First" Event at the end of this month. 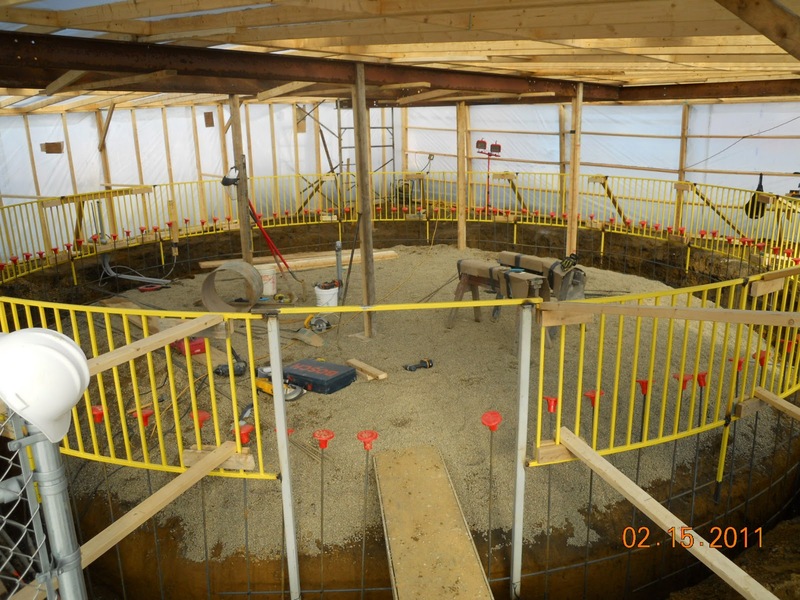 Take a look below to see how exciting the ride will be! 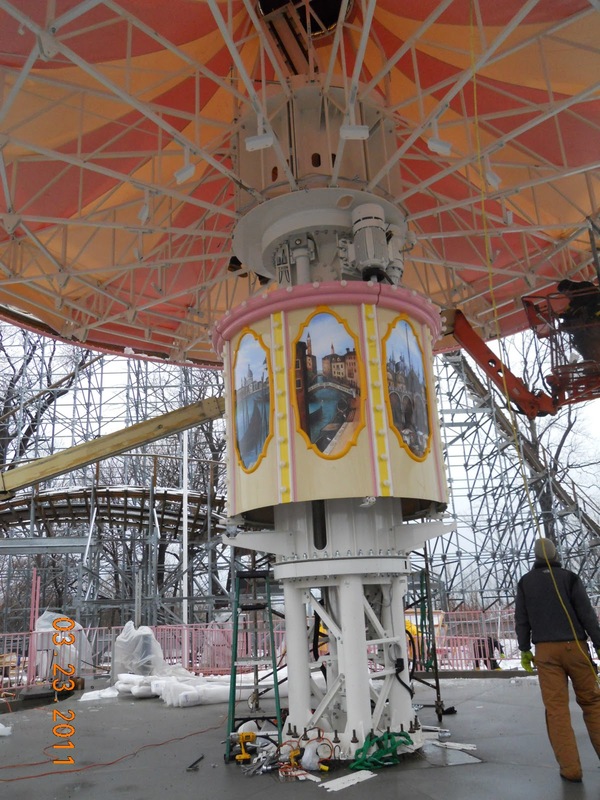 After much hard work and determination, Wendy Bear's new tea cup ride spun for the first time down at the North End. 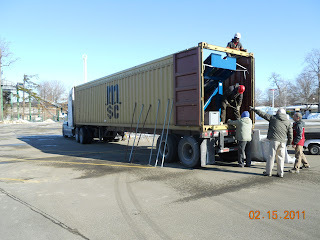 It has been a long time since the first time we laid eyes on the new ride, packed away in a container. But a little elbow grease and electricity was all it took to get Wendy's Tea Party spinning. Take a look at the video below to see for yourself! The cups and pot look great going in circles but without riders, the cups don't spin very much. 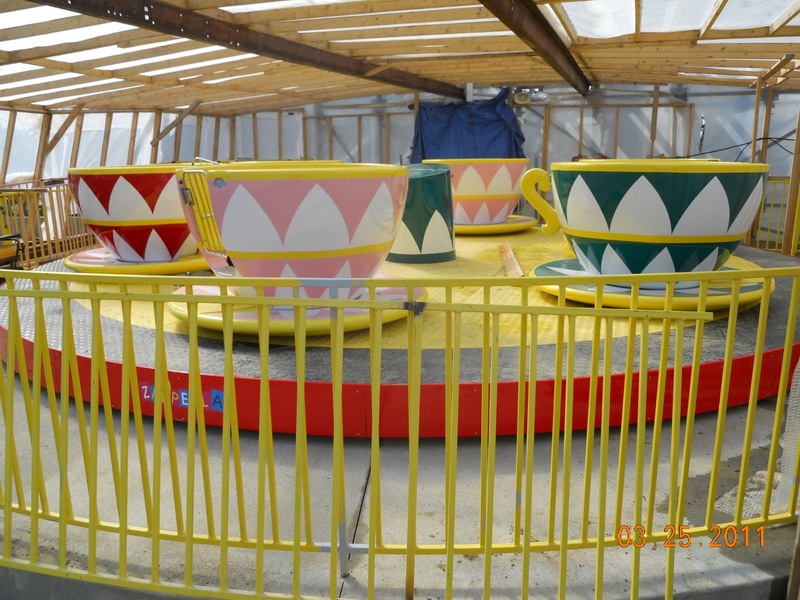 Once the first riders choose their cups, they will be able to spin their cups as fast or as slow as they want! With all the exciting things happening at the North End, it is easy to forget the other great things at Waldameer. 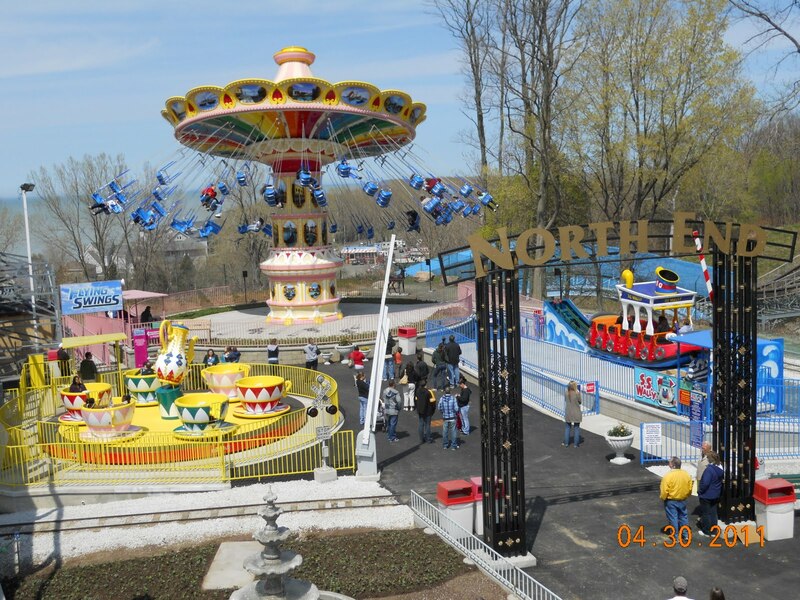 But plenty of work is going on outside the North End to get the park ready for this summer including the first delivery of Waldameer's supply of plush. These stuffed animals and characters will line each midway game wall this summer eagerly waiting for a lucky Guest to "win" their hearts! Rainbow Gardens looks stuffed with all this stuffed stuff! All the bags and boxes get unloaded from a full semi truck into Rainbow Gardens where they are sorted and selected before being placed in storage. 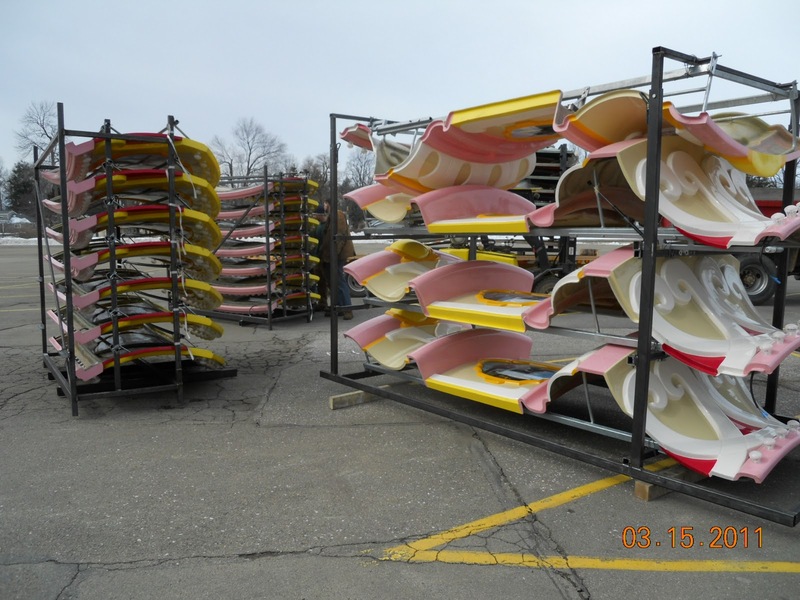 The midway games aren't the only thing getting ready for summer. Waldameer's rides are starting to be dusted off and put back together for the summer season. April showers call for an umbrella! The first ride ready for summer! Before you know it, the sun will be shining and Waldameer will be back to doing what it does best... Family Summer Fun! 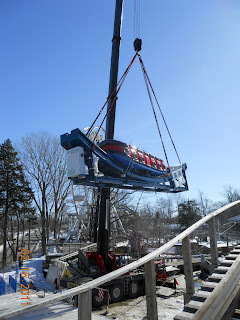 Even with near freezing temperatures, Waldameer was all smiles today as the new C.P. Huntington train engine and wheelchair accessible coach arrived this morning. A short track for a new train! 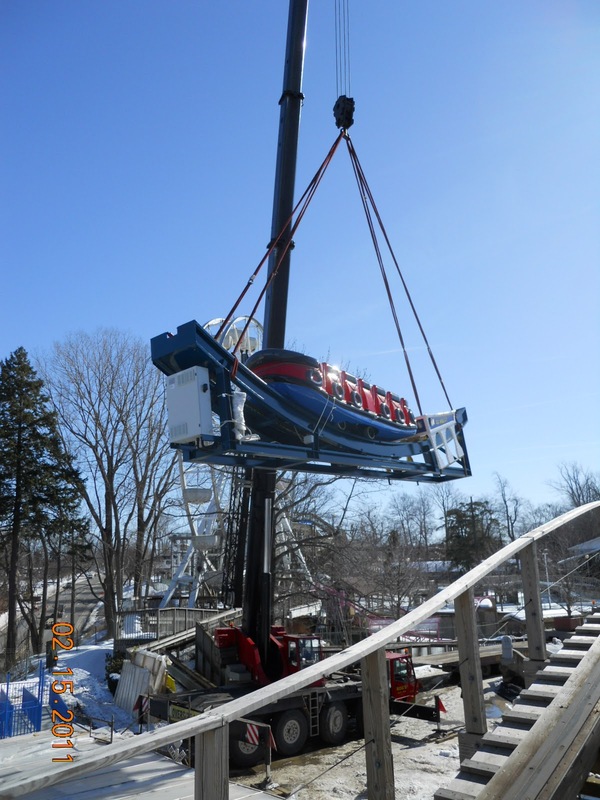 The engine, painted sleek black and maroon, will replace Waldameer's 1971 C.P. Huntington that has been in operation since the early 1970's. Old and New, side by side. The new coach, painted bright blue, is equipped with a wheelchair accessible ramp allowing all Guests the opportunity to enjoy a ride on the train. Brand new and all blue! This season, the train will seem more colorful than usual, having a maroon engine and a blue coach followed by red coaches. Don't worry! It is not a mistake! 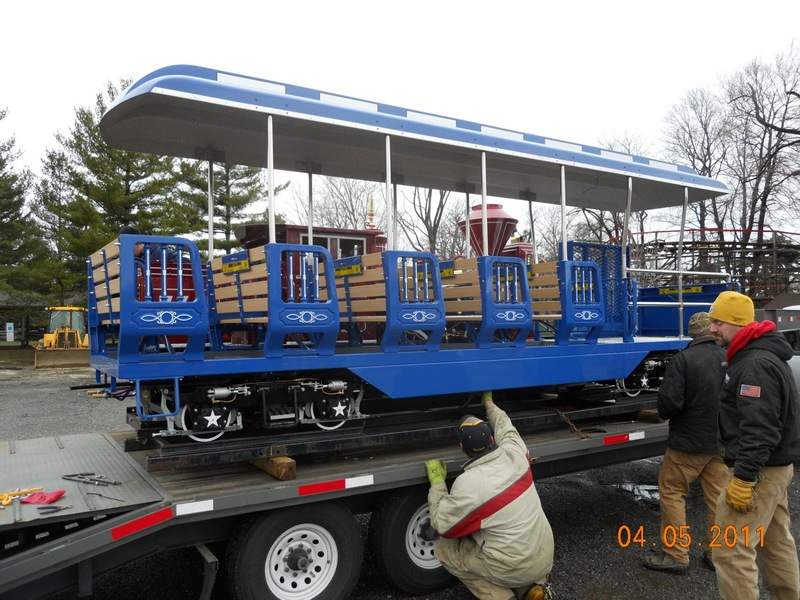 Waldameer has plans to purchase a brand new blue engine, complete with three blue coaches this fall. This will allow Waldameer to operate two separate trains on weekends for the 2012 season. The more rides, the merrier! Since the official start of the Spring season, the North End has been blooming with activity and color. 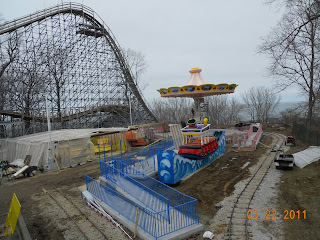 All three rides are starting to come together and the North End is beginning to feel like a part of Waldameer. 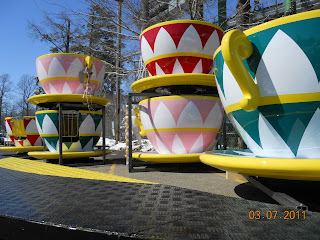 Wendy's Tea Party has sprouted up tea cups in beautiful shades of green, pink and red. All that is left is the center tea pot and the ride will be spinning with fun! 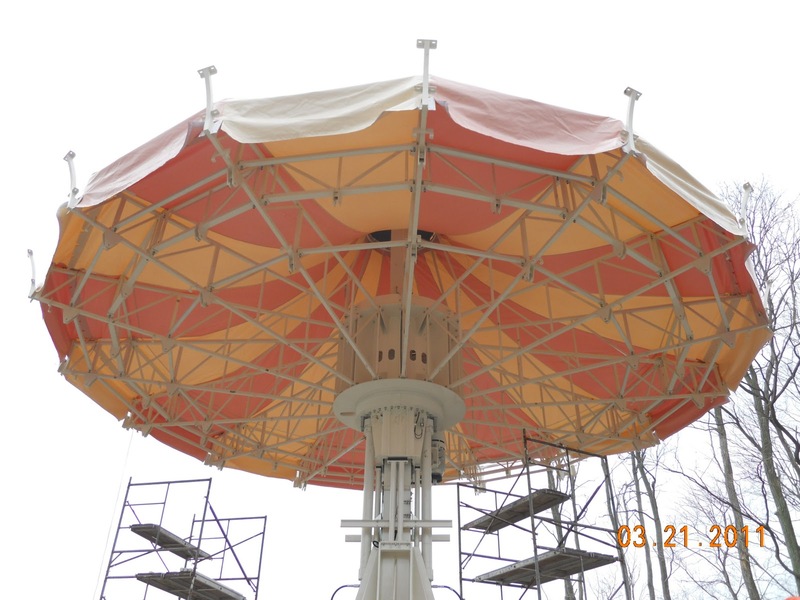 The Flying Swings is also blooming for Spring. The top canvas, crown and ceiling panels were installed this past week along with two sections of the center hub displaying colorful, hand-painted scenes of Italy. 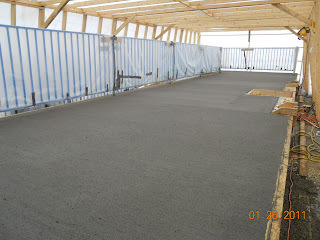 Soon, chairs will be growing from the ceiling to carry riders around and around! The North End will be Rockin', Spinning and Flying its way to summer fun sooner than you think! No, I'm not talking about Aquarius or Gemini or even Scorpio. I'm talking about signs for the new rides in the North End! Each new ride finally has a great big sign to tell Guests which ride is which. Like I said before, it must be a sign that the North End is getting close to being completed! Take a look below at the colorful works of art. Wendy decided not to sign this one! Does it look Wally is trying to use sign language? The North End got a taste of the Bronze Age today as six of the seven bronze statues arrived early this morning. 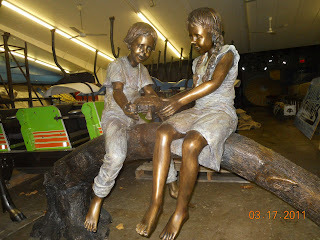 The truck from Randolf Rose statues pulled up to the Skeeball building and out came girls, boys, turtles, puppies and an 8-foot tall white-tail buck! These statues will all be featured in the North End in typical Waldameer design. 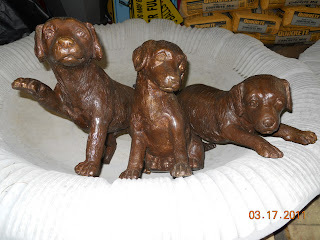 There is only one more statue that has yet to come to finish decorating the North End. We will have to wait and see just what it could be! It was another exciting day in the Waldameer parking lot today. The final two containers arrived on time filled with tons of colorful paneling to fit on the Flying Swings. 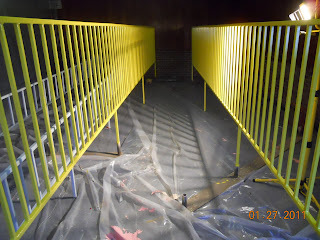 All the pieces had thousands of lights and were beautifully painted with bright colors. Some of the pieces even had hand-painted murals of Italy on them! Stacked and ready to unload. Colorful tops to crown the Flying Swings! 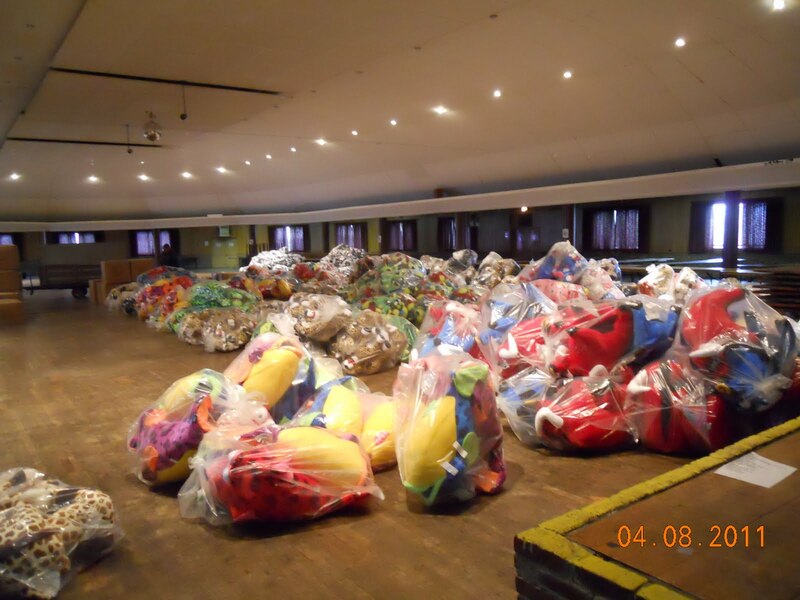 All of the parts and pieces were stored away until it is time for assembly of the ride. 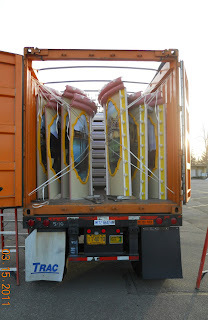 The metal racks kept the pieces safe during transit. 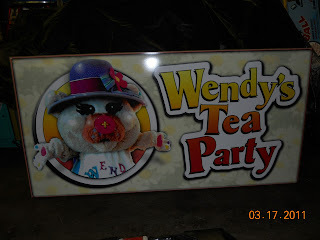 A for Wendy's Tea Cup ride, we just couldn't wait to put some of the pieces together! 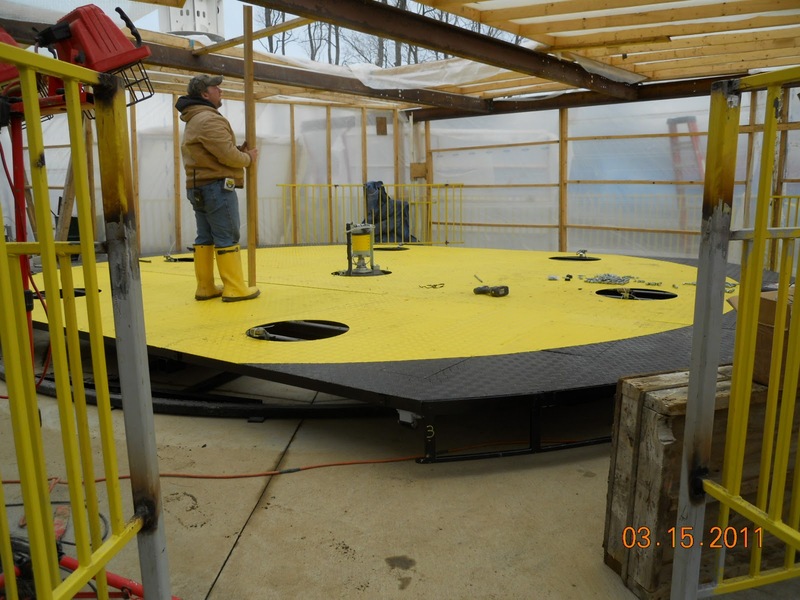 The circular track and the rotating platforms were put in place today just to see if they would fit. It all came together like a puzzle! Something is missing in this picture. Maybe a few tea cups! Now all that's needed is a few tea cups and a tea pot and kids will be spinning in no time! It was a beautiful day to fly today. Fly the Flying Swings that is! The first container arrived this morning in Waldameer's parking lot carrying the first batch of pieces to the third and final ride featured in the new North End. Blue seats galore! Some even fit two riders so kids can ride with their parents. Inside the 18-wheeler were plenty of blue seats, frames and of course, the monstrous center of the ride. Everything was unloaded and put to the side while everyone focused on lifting, tilting and setting the center piece at its new home. 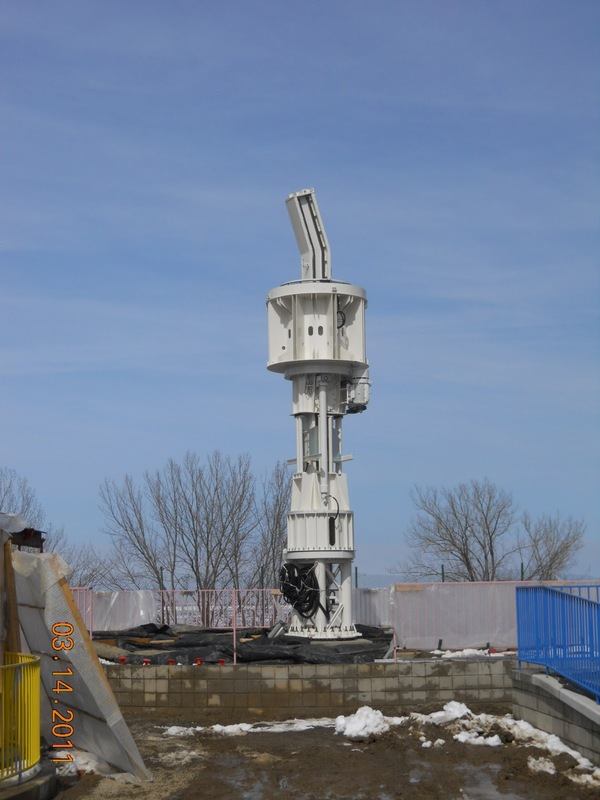 How do you remove a 33,000 pound ride part? Very carefully! But the Flying Swings ride is so huge that there are more pieces coming tomorrow! 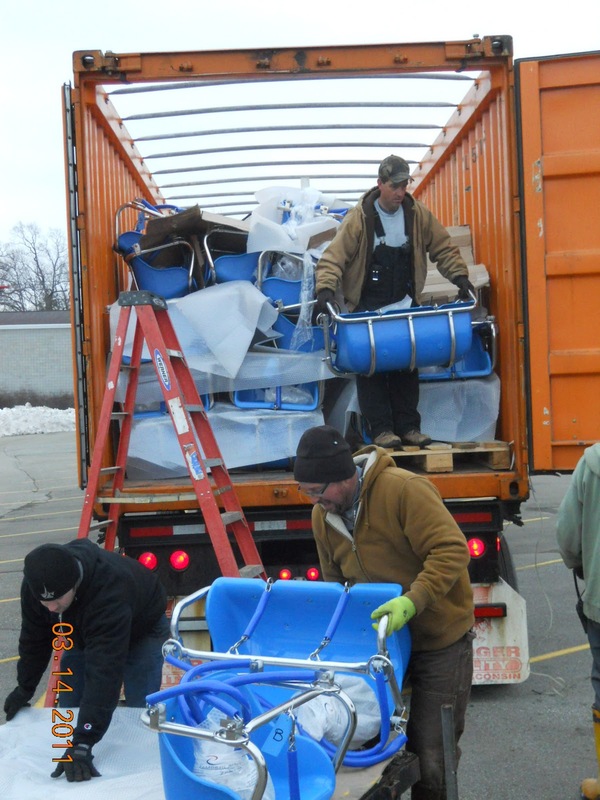 Two whole containers are arriving tomorrow to deliver the remaining parts and pieces needed to complete the main attraction of the North End. 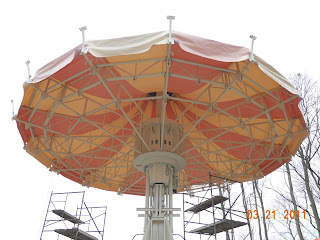 For now, the lonely center stands tall, looking out over the lake and waiting for warmer weather. The first part of the Flying Swings, standing tall. 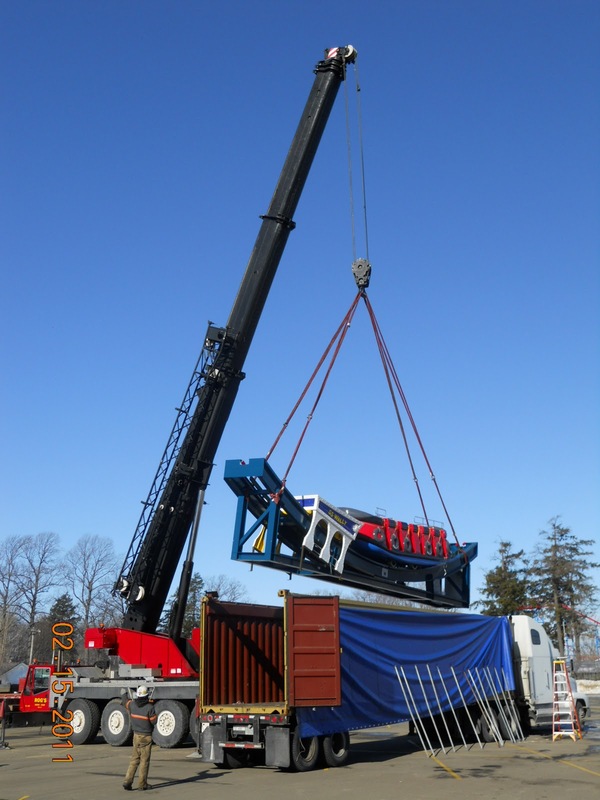 Despite the snowy roads in western Pennsylvania, the second new ride for Waldameer's North End arrived safe and on time this sunny morning. 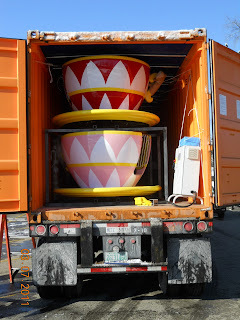 The teacup ride was unloaded and unpacked under the direction of Wendy Bear, whom the ride is named after. At the site for the ride, the final preparations are being made before Wendy's Tea Party can be set in position. The tea cups lined up all in a row. Here is my handle, here is my spout! The next big event is scheduled for a week from today where the last and largest of the three new rides will arrive. 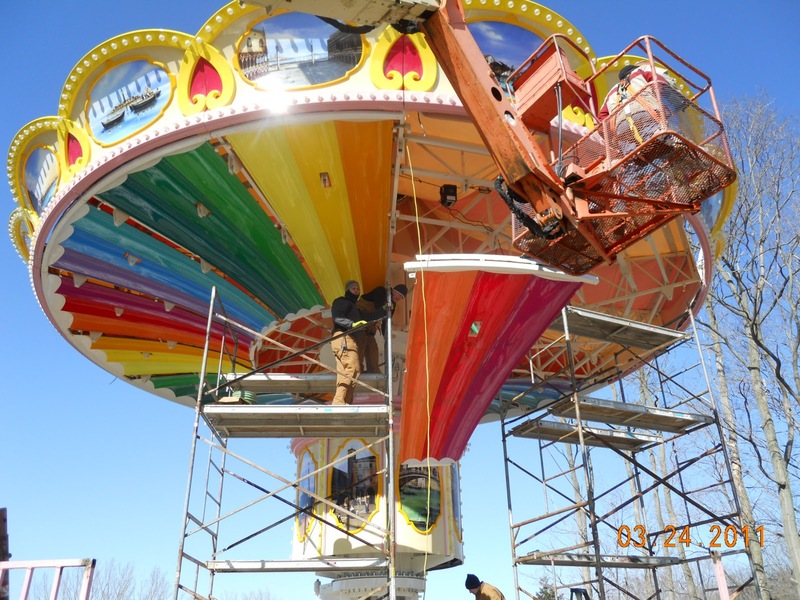 The iconic Flying Swings will be delivered in three containers and will require a very large crane to unload. 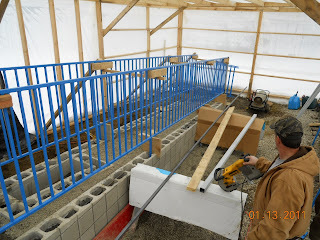 As the days continue to turn and the snow continues to melt, it is only a matter of time before the first riders will be seen laughing and enjoying the brand new North End! 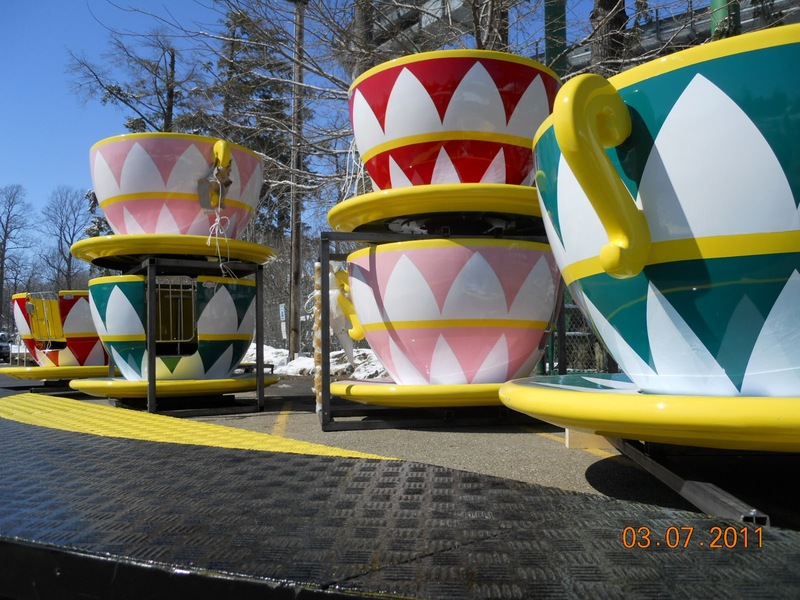 As the snow slowly melts, a time and day are set for the arrival of the second ride in Waldameer's new North End, Wendy's Tea Party. Wendy's Tea Party will have a spot to be placed once it arrives! With the tea cups traveling down the highway, planning is already under way for the arrival of the third and final ride, the Flying Swings. With two months left before the North End's debut, there is little time to waste! There wasn't much time to celebrate after the SS Wally arrived on scene at the North End yesterday. So much still has to happen for the North End to be ready for Guests come April 30th. The next thing on our list: Wendy's Tea Party. Ever since we decided to have Wendy be in charge of the new Tea Cup ride, it seems that she has been taking her time getting things prepared. I mean, Wally Bear already has his ride in position! But don't think that Wendy has been snoozing all winter! She has been carefully planning the construction of her ride since day one. Some say she is even more organized that Wally ever was! 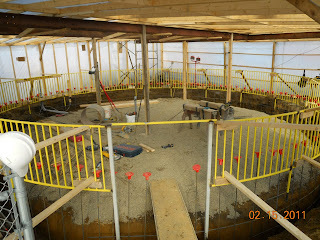 A view inside the building shelter of Wendy's new ride. Wendy's Tea Party Ride is set to arrive the first week in March and everything is right on schedule. 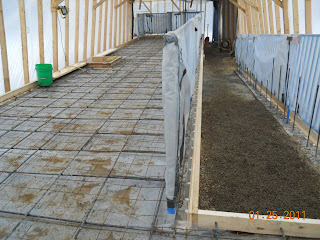 The first pour of concrete finished today and the final pour is scheduled for next week. Crews are working overtime to make sure Wendy's deadlines are met. When talking to one of our workers, they described Wendy as "a very nice bear to work for... as long as you do what she says!" 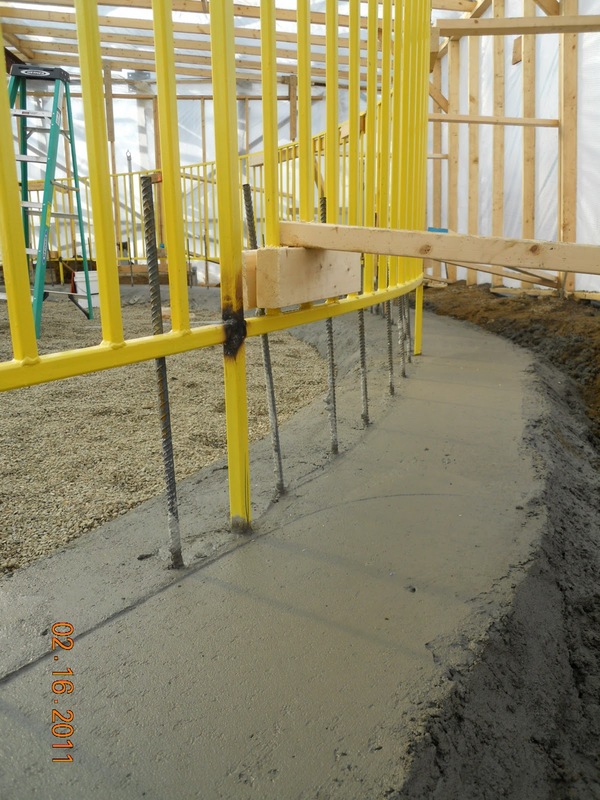 Waiting for concrete to set is like watching paint dry! With Wendy in charge of the show, there is no doubt that by the time her ride arrives, we will be ready to set it up. The good ship SS Wally sailed into port today and docked in the North End. It has been a long journey for the small tug boat, sailing all the way from Italy. 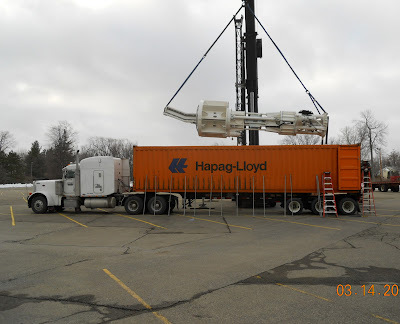 Rog's Rigging met the SS Wally in the parking lot to offload it from the container. Then it was high flying and tight driving all the way down to the North End where the ride was laid perfectly in position. It was a tight squeeze to fit a whole ride in a container! 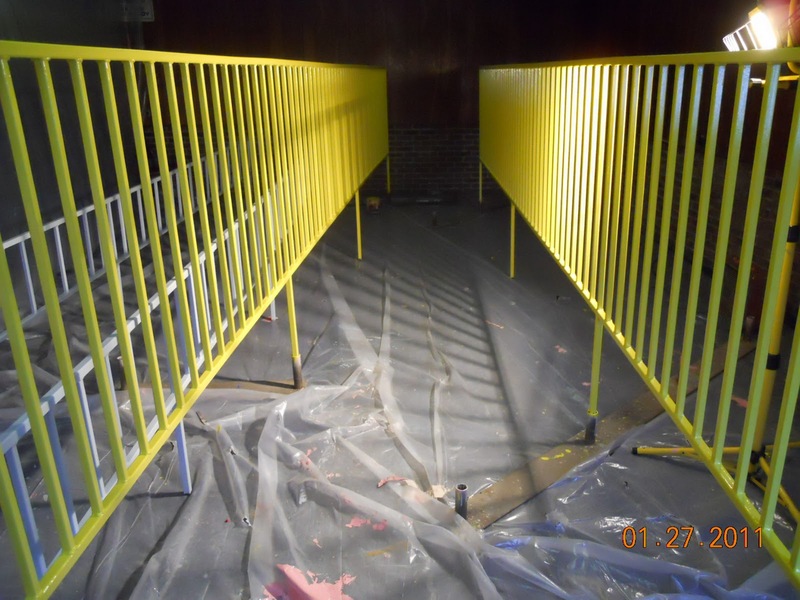 The production was caught on film by Action News 24, WICU and WSEE television stations along with a personal interview with Mr. Nelson. Stay tuned tonight for the evening broadcasts to catch a glimpse! The Erie Times News was also out to snap several photos for tomorrows printing of the paper. 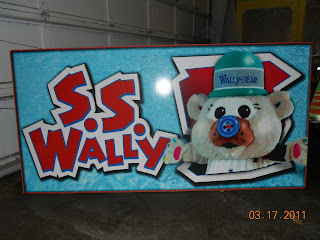 It's a bird, it's a plane, it's the SS Wally! Now that one ride is here, we are still waiting on two more, Wendy's Tea Party and the Flying Swings. Wendy Bear has been tracking the progress of her ride and thinks it should arrive sometime in the first week of March. 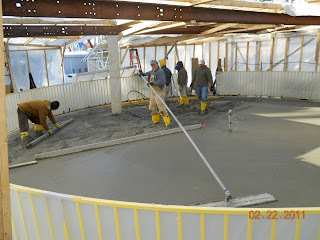 Meanwhile, crews are working hard to try and get the spot ready for the Tea Cups to sit. 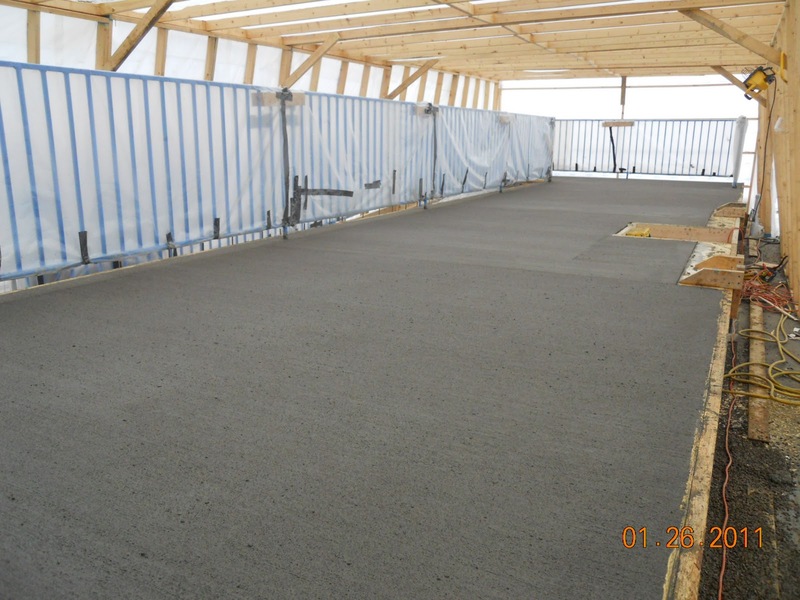 With a few more days filled with sun and warm weather, we should be ready just in time for the ride to arrive. There is no turning back now! 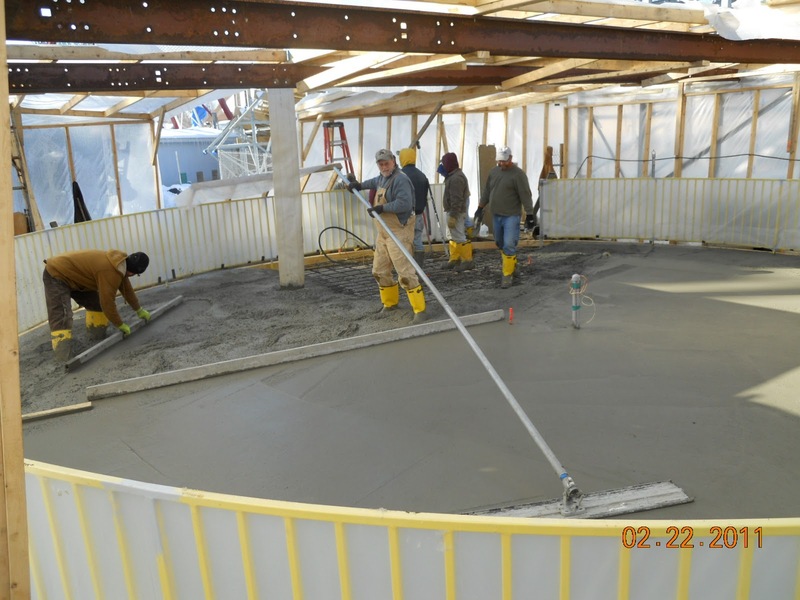 The SS Wally will soon be permanent after pouring the final slabs of concrete Thursday and Friday. It seems only yesterday when the grass was still green in the train circle. The loading/unloading platform and the exit ramp for the SS Wally. 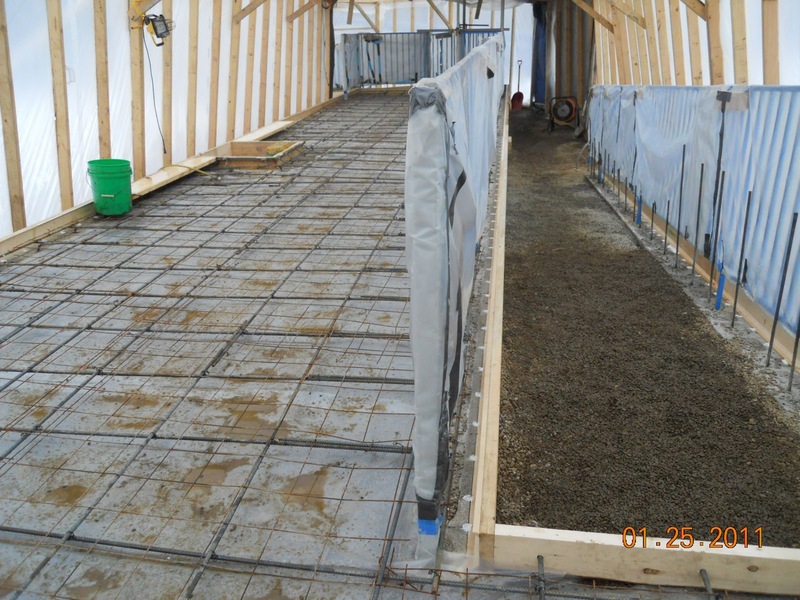 With the final cubic feet of concrete poured for the SS Wally, the next step is to hurry up and wait! The SS Wally is due to arrive in Erie, PA in early February in containers delivered from Italy. Unfortunately, there is not much to do until the snow starts to melt. Once the weather turns though, Wally Bear promises to have his ride put together in no time! You might be able to see Wally Bear's paw print in the freshly poured concrete! Wendy Bear on the other hand is taking her time putting together her ride. She says there is not much to it. She did decide on a color for her fence though, and almost all of the sections are already painted! Old Man Winter is still up to his old tricks, dumping piles of snow on Waldameer and the North End. But don't think for a second that a little snow is going to keep us from working! The North End says to Old Man Winter, "Bring it on!" 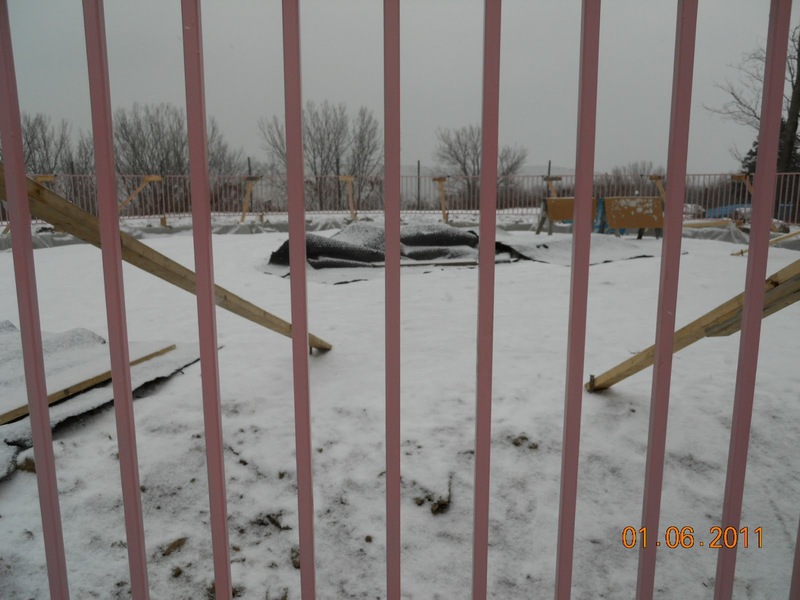 as more and more progress is made at the new expansion site. 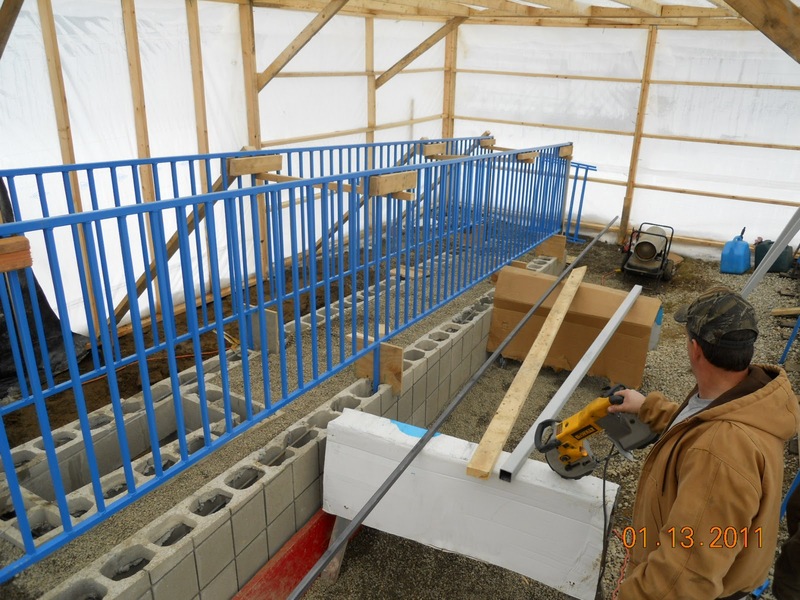 The latest news from the North End involves something blue and pink and it's not a baby shower. It's the Flying Swings and the SS Wally getting their fence! After the New Year Celebration, crews have been busy fencing the two new rides in order to have everything ready come April when the rides arrive from Italy. 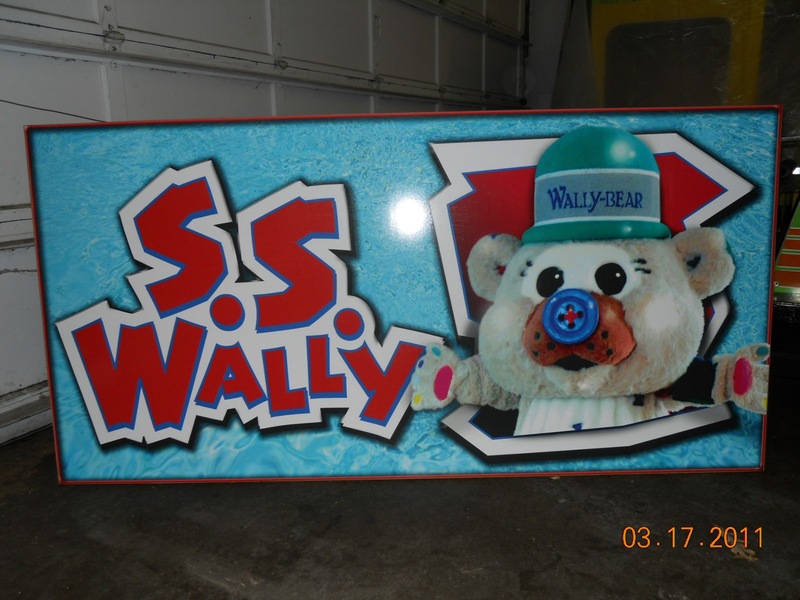 Since Wally Bear's favorite color is blue, he choose the fence for the SS Wally to be blue. It was harder to choose a color for the Flying Swings fence but after looking at pictures of the ride, it was decided that the fence should be light pink. Both of the fences look good so far. 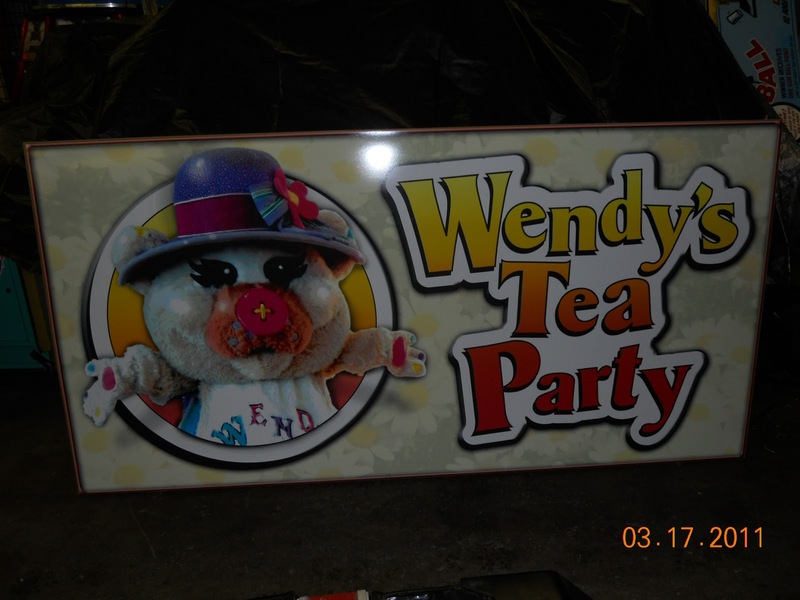 Wendy Bear is still trying to decide what color to paint the fence for her ride, Wendy's Tea Party, but she says she'll be ready when the time comes to decide. Hopefully the bright colors will ward off Old Man Winter from dropping any more snow on Waldameer!